From 1981 to 1986 he was Music Director at the Teatro Regio di Parma, where he devoted most of his time to Verdi operas and Chief Conductor of the Orchestra Sinfonica „Arturo Toscanini“. 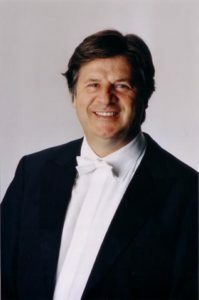 From 1986 to 1990 he was Chief Conductor and Musical Director of the Koninklijk Filharmonisch Orkest van Vlaanderen in Antwerp, which achieved an international reputation during this period and toured in Germany, Italy, Great Britain and France. Günter Neuhold was General Music Director at the Badisches Staatstheater Karlsruhe from 1989 to 1995. In Karlsruhe he performed a Richard-Strauss-Zyklus and the „Ring des Nibelungen“. From 1995 to 2002 he was General Music Director and Artistic Director at the Theater der Freien Hansestadt Bremen. From 2008 to 2014 he was Chief Conductor and Music Director of the Orquesta Sinfonica de Bilbao. 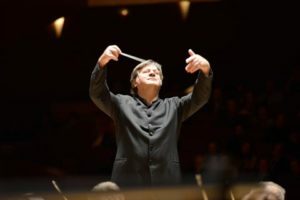 Beside his permanent engagements he conducted the following orchestras: Wiener Philharmoniker, Wiener Symphoniker, Staatskapelle Dresden, Philharmonia Orch., Orchestre National de France, WDR Köln, mdr Leipzig, NDR Hamburg und Hannover, SWF Baden Baden, SDR Stuttgart, RSO Berlin, Gürzenich-Köln, HNPO Budapest, ORF, RAI, Orch. Sinf. Naz. Torino, Maggio Musicale Fiorentino, Orch. Teatro Mass. Palermo, Orch. Sinf. Siciliana, La Fenice Venezia, BBC-Cardiff, Capitole Toulouse, Bordeaux Aquitaine, Orchestre Philharmonic de Nice, Orch. Philh. Monte Carlo, RTVE Madrid, Real Orqu. Sinf. de Sevilla, Liceu Barcelona, Orqu. Sinf. de Madrid, Bilbao, San Sebastian, Tenerife, Gran Canaria, Granada, Gulbenkian, Malmö S.O., Singapore Symphony, Qatar, Malaysian, Shanghai, Tianjin, Hangzhou, Incheon, Masan, Changwon, Busan, Tokyo Philharmonic, Metropolitan, Yomiuri, Orqu. Natcional Argentina, Orqu. Filarmonica TeatroColón, Córdoba, Orqu. Sinf. de São Paulo, Sinf.Brasileira RJ, Orqu. Sinf.Nacional, OFUNAM Mexico City, Guanajuato, Guadalajara, Radio-TV-Tchaikovksy Moskau, Canadian B.C. Vancouver, Ontario Phil, ABC Australia Melbourne, Auckland. The Chamber Orchestra of the Maggio Musicale Fiorentino counts among its ranks musicians that reached the apex of the instrumental maturity thanks to the experience gained over the years within the prestigious Florentine Theater under the guidance of the greatest conductors of all time including Zubin Mehta, Carlo Maria Giulini, Giuseppe Sinopoli, Carlos Kleiber, Herbert von Karajan, Leonard Bernstein Claudio Abbado, Georges Prêtre, Seiji Ozawa, Riccardo Muti, Lorin Maazel, Semyon Bychkov, Myung-Whung Chung. They propose themselves as sensitive interpreters in adapting the timbre and phrasing to the expressive needs of a repertoire that ranges from the great Italian instrumental music of the 1700s, to European romanticism, to the various artistic currents of the 20th century, combining the typical brightness of the sound Italian to a rigorous care and discipline. The Chamber musicians have by their nature a flexible and variable staff based on the contexts and repertoires entrusting soloist parts of great virtuosity to the soloists of the group, all first parts of the Orchestra del Maggio Musicale Fiorentino. Cameristi del Maggio Musicale Fiorentino has the privilege of bringing the name of the Florentine Theater to the world: they are regularly guests of International Relevant Festivals, they perform in prestigious halls and boast collaborations with leading soloists of the international scene, including Placido Domingo, Andrea Bocelli, Salvatore Accardo, Pinchas Zukerman, Mario Brunello, Andrea Lucchesini, Vadim Repin, Boris Berezovsky, Daniele Callegari, Michael Guttman, Nestor Marconi, Anneleen Lenaerts, Toby Hoffman, Sergio Tiempo and Karin Lechner. The ORCHESTRA OF TOSCANA CLASSICA is made up of 95% of young orchestra professors, graduated both in Italian music conservatories and from prestigious academies all over the world. Founded in 1999, it has about 450 concerts between orchestras and chamber music produced on its own, also organizing itself in agile chamber formations. This has been possible thanks to the support of the Municipality of Florence and the Tuscany Region. Moreover, since 2015, the Ministry for Cultural Heritage and Activities, recognizing its merits, has included it among the Youth Music Production orchestras. The aim of the project of Toscana Classica is to offer its members new graduates / new graduates, aged between 18 and 35 years, a professional outlet, making productions of the highest level, having the opportunity to collaborate with institutions of high prestige (including the Teatro Comunale di Firenze, The Goldoni Theater and the Regional Orchestra of Tuscany) and young soloists who are hosted during the season, all winners of national and international competitions. Young and promising conductors who will alternate in the orchestra direction come from masterclass selections and national and international orchestral conducting competitions. Great importance is given to the ensemble music for classical orchestral orchestra with strings and winds, as a continuation with respect to the artistic purpose that they have proposed to reach. The Toscana Classica association, performs its concerts in the most prestigious Florentine museums and in places of high artistic and cultural prestige of Tuscany to promote the development and diffusion of a musical cultural consciousness, within the marvelous frames of the places of art.